“The decisions of the Cop 24, namely Paris Rulebook, must be adhered to by all the stakeholders” –said the State Minister for Foreign Affairs Mr. Md. 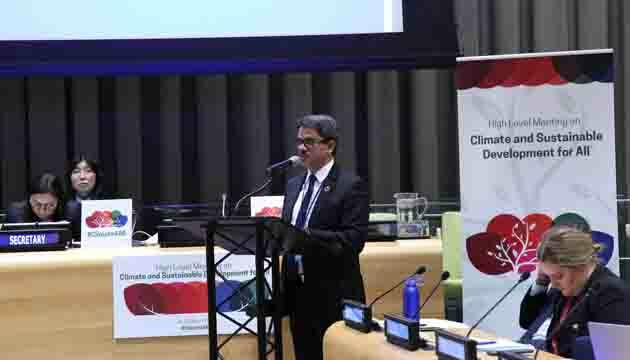 Shahriar Alam, MP at the High-Level Meeting on ‘Climate and Sustainable Development for All’ at the UNHQs, today. “The big emitters must go for rapid mitigation of GHGs, and the pledges made in the Paris agreement to mobilize 100 billion USD annually by 2020 and an ambitious replenishment for the Green Climate Fund in 2019 must be materialized. 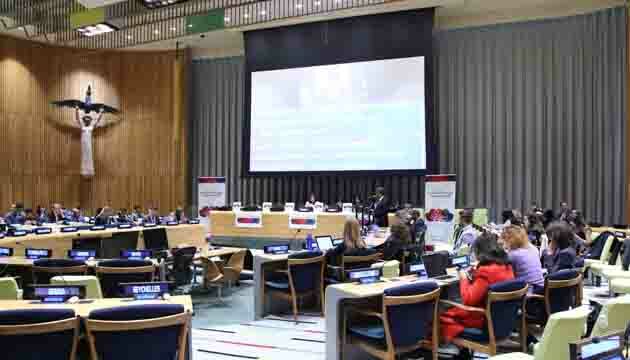 The international community must support the vulnerable developing countries with financial resources and appropriate technologies in support of their adaptation efforts” the State Minister emphasized. Quoting Prime Minister Sheikh Hasina, the State Minister said, “Bangladesh will never exceed the average per capita emission of the developing world.” He reiterated Sheikh Hasina Government’s commitment to the Paris Agreement and informed the meeting that Bangladesh has mainstreamed climate actions and disaster management in its national planning and sustainable development strategy where over 1 percent of GDP is being used to combat climate change. Highlighting Bangladesh’s sustainable development and resilience building initiatives for tackling the climate change, the state Minister further said, “Considering multidimensional vulnerabilities posed by climate change and disasters, our Government has recently adopted Delta Plan 2100, which will provide Bangladesh with the sustainable development pathway for the next 100 years. We have also adopted ‘Carbon budgeting’, ‘de-carbonization of manufacturing pathways’ and low-carbon industrialization plans. To ensure food security, we have been investing in transforming our agriculture and making it more resilient to the impacts of climate change including introduction of drought and salinity resistant crop varieties. Initiatives have been taken to increase tree coverage from 22% to 24% in the next five years. A project worth 50 million dollar is being implemented for the conservation of the Sundarbans”. 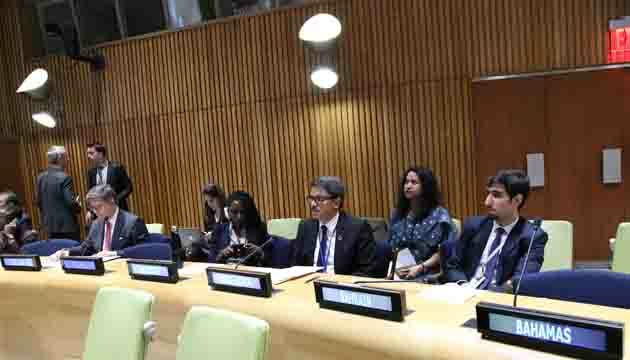 He also shared some disaster preparedness measures by Bangladesh like ‘early warning system’, dissemination of information through ICT, establishment of cyclone shelters etc. The forcibly displaced 1.1 million Rohingyas from Myanmar is not only impacting our land and environment severely but also our development and adaptation efforts, he added. 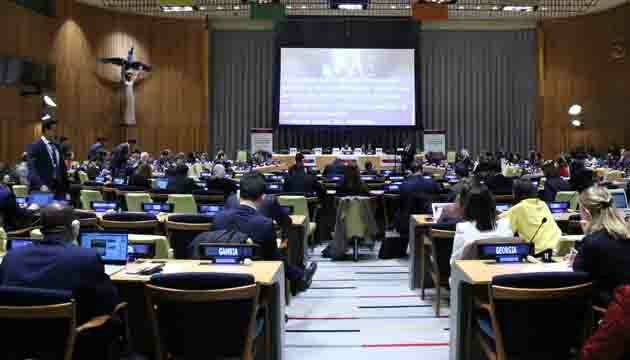 The General Assembly convened this meeting to focus the protection of the global climate for present and future generations, in the context of the economic, social and environmental dimensions of the 2030 Agenda for Sustainable Development. It is a part of the preparatory process for the upcoming Climate Action Summit of the Secretary-General scheduled in September 2019 to achieve the long-term goals of the Paris Agreement and the 2030 Agenda. Bangladesh High Commission in Islamabad observes National Mourning Day-2018 with due solemnity and passion. 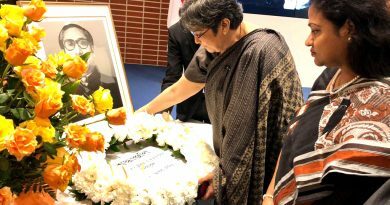 Embassy of Bangladesh in The Hague observed 43rd martyrdom anniversary of the Father of the Nation, Bangabandhu Sheikh Mujibur Rahman and the National Mourning Day. 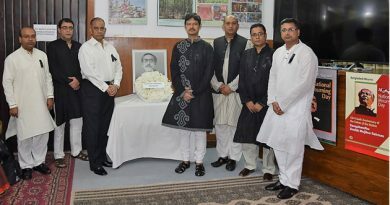 Bangladesh Embassy, Tokyo pay tribute to Bangabandhu on the National Mourning Day-2018.